The beauty of nature inspires good and positive feelings in a person. The artist behind this ketubah too was inspired by the lush greenery that surrounds us outside. 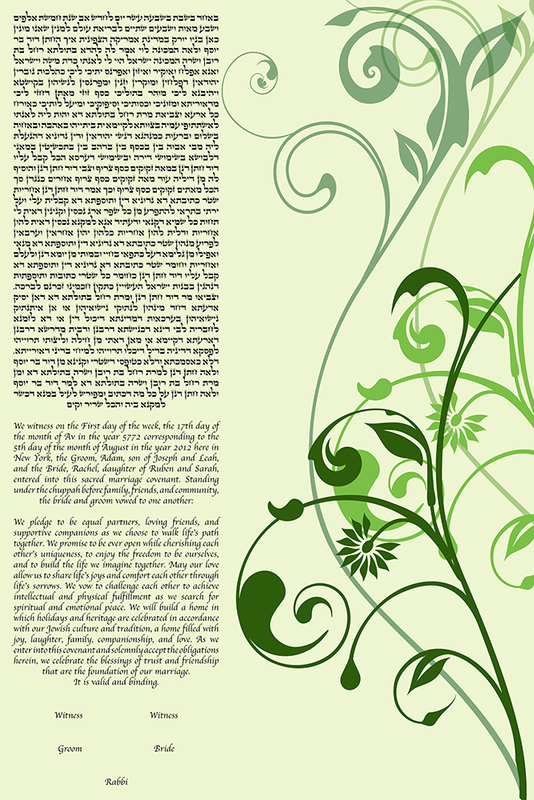 The right side of the ketubah is entangled in green vines of leaves and flowers. The varying shades of green swirly plants instills a sense of creativity and freshness. This ketubah is perfect for couples who are inspired by nature. Their relationship will be evergreen and always retain that initial feeling of wonder and excitement. Man has found solutions to their biggest problems in nature, and similarly couples inspired by nature will be there to solve and eradicate each other’s problems.